After visiting Savannah for this year's SIBA convention, I knew I wanted to read AMONG THE LIVING by Jonathan Rabb. 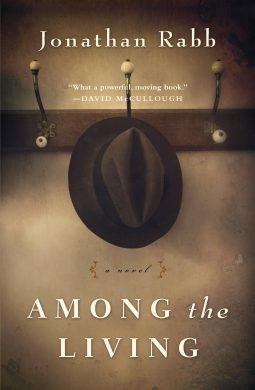 This novel takes place in Savannah in the late 1940s; and after falling in love with the city, I was curious to see how Savannah would be portrayed. In addition, the description of this novel was intriguing to say the least -- a Holocaust survivor immigrating to the United States. AMONG THE LIVING tells the story of Yitzhak Goldah, a survivor of the concentration camps in Nazi Germany. Two years after his release, he moves to Savannah to live with Abe and Pearl Jesler, his only known relatives. Abe and Pearl are an older couple without children, and they are anxious to introduce Yitzhak into their closely knit Conservative Jewish community in Savannah. Yitzhak has a bit of a culture shock to say the least when he arrives in Savannah. He quickly realizes that there is an interesting dynamic between the Reform and Conservative Jews -- basically they live entirely separate lives; and he doesn't really feel their differences are all that important considering what he's lived through in Germany. In addition, Yitzhak's life is further complicated when he falls in love with Eva, a widow with a young son whose husband died in the war. Eva's family is part of the Reform community, and their relationship is quite controversial. And then a woman from Yitzhak's past shows up, one whom he thought was dead; and he is forced to decide whether he wants to go back to his past life or start a new one with Eva. I am really torn about AMONG THE LIVING. Overall, I liked the book and found the writing to be pretty special. And for the most part, I appreciated the complexity of the novel (more on that later!) However, it was almost as if there was too much going on. There were a few storylines that I thought weren't exactly necessary, and maybe even took away from the quiet beauty of the novel. My description of AMONG THE LIVING doesn't really encompass everything the book is about. There is a storyline concerning Abe Jesler and his shoe business that I didn't really enjoy. It has to do with an illegal business, and while I understand why it was in the story, I felt as if it was a bit of a departure from the rest of the story. Maybe it was because I so enjoyed the parts of Yitzhak's assimilation (or lack thereof in some cases) into Savannah's society, but I found myself wanting more of that rather than the Abe's business troubles. I actually found Yitzhak's character to be incredibly well written. I loved seeing the challenges he faced when he arrived in the South. For example, one of the first things the Jeslers did was Americanize his name -- just think about that. In addition, the longtime Jewish community is Savannah was totally separated based on whether they were Reform and Conservative. Naturally, Yitzhak falls in love with someone outside of the Jeslers' community, and he's perplexed as to why these Jews should have such differences. Heck, he survived a concentration camp and these people can't socialize together because their religious views are different? Another aspect of the story that I really, really liked was how the author juxtaposed what the Jews in Europe experienced with what the blacks in the South experienced. Granted, there are some major differences but there are quite a few similarities too. I found it particularly interesting that Yitzhak could relate more to the blacks in the story than the Jews. All in all, I thought these race issues provided a lot of food for thought. This might sound a bit shallow in a book about such serious issues, but I loved that Savannah was the setting. I had no idea that there was such a prominent Jewish community in the city, one that had been there since the founding of the colony. What I found so much fun, though, was that the characters actually visited places that I went to during my trip to Savannah like Leopold's ice cream shop and the Crystal Beer Parlor. I do think AMONG THE LIVING would make an interesting book club selection. I was happy to find a reading guide with eleven thought-provoking questions. There are so many huge issues to discuss including race, religion, and class; and I have no doubt that you could analyze Yitzhak's life and decisions for some time. Overall, I enjoyed AMONG THE LIVING and found the character development and writing to be very good. It also delved into some very interesting concepts that will make you think long after finishing the book. This sounds like a complex novel. I picked it up at SIBA too and am looking forward to reading it. I have not heard of this book before. I really appreciate your well- written, thoughtful review. I have added it to my TBR pile.